Is your recycling in Westminster being recycled? You may often wonder, what happens to your recycling after it is collected? All the recycling collected by Westminster City Council is treated to the highest standards via technologically superior processes ensuring that all that is recyclable actually gets recycled by our trusted long term partner Veolia, at their materials recovery facilities. However, this might not the case for some other waste collectors who rely on outdated facilities which are inefficient at segregating recycling properly. How these efficient sorting facilities perform is public information which can be accessed via this online portal. This infographic shows where all waste and recycling collected by Westminster City Council ends up and how it is processed. Everything that is collected as recycling by Westminster City Council is actually recycled and whatever can’t be is turned into green energy. Mixed Recycling that has been collected is separated using different machines and processes. Magnets are used to extract ferrous metal, which is recycled back into new steel for packaging and construction. Infrared scanners extract various plastics types which are recycled into new plastic for packaging or garden furniture for example. Screening, also known as ‘star ‘ screen’ is used to extract paper, cardboard and glass which is sent to paper mills and glass smelters ready to be recycled into new packaging. Eddy currents extract non-ferrous metals such as aluminium which is recycled back into rolls of sheeting used to make cans. Recycling, such as glass and paper/cardboard, which has been separated at source goes straight to the paper mill and glass smelter via our waste transfer station where its bulked up in larger loads which can be transported more efficiently. How do I know my recycling gets recycled? There are many scare stories in the media about recycling not actually getting recycled. Whilst properly segregated and processed recycling does not pose any issues, sometimes things leave to be desired when recycling isn’t properly segregated. Sometimes other waste collectors collect both rubbish and recycling in the same truck; once they’re mixed they can’t be recycled and end up tipped as general waste. If you want your recycling to make a difference, with a company that guarantees proper recycling of your recyclable material then make sure you start recycling with Westminster City Council’s Commercial Waste Services. We’re always happy to take you round the facilities that process your waste and recycling. Just contact us and ask for the next available tour. 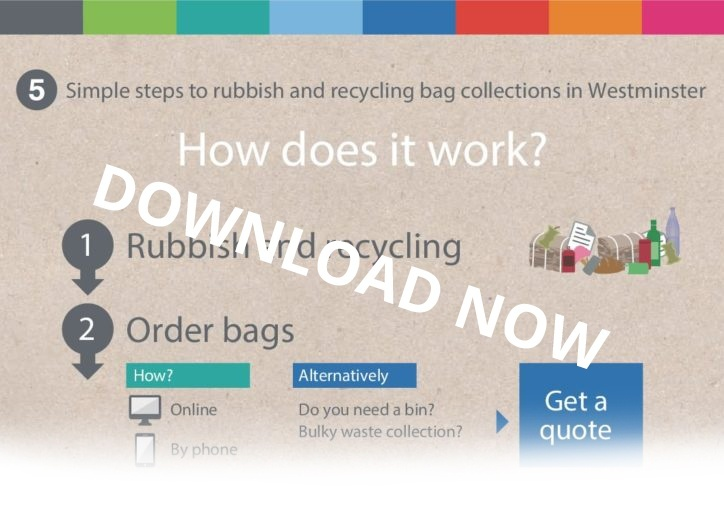 To see how easy it is to get started with recycling in Westminster, download our infographic below. Or to find out more about our recycling services click here.